Artistically blurring moving elements in a photograph can offer a new way to represent familiar scenes. 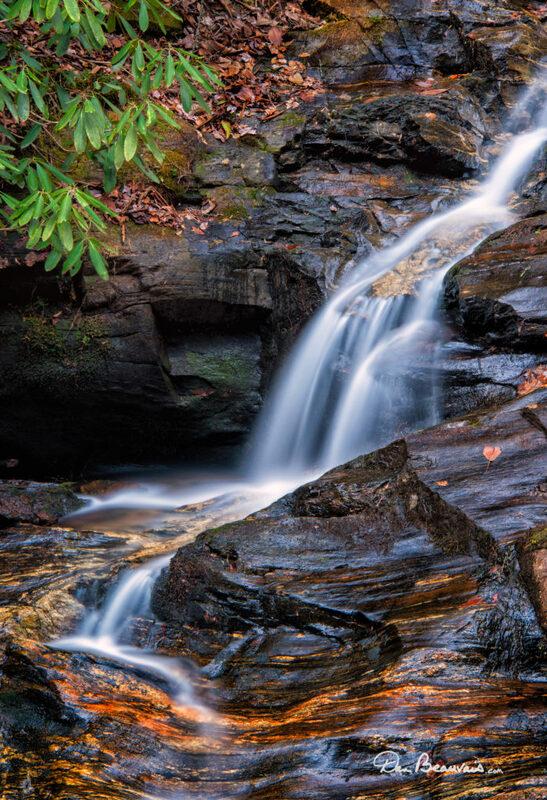 A ten stop neutral density (ND) filter renders a wonderful softness to waves, waterfalls, and moving clouds. It’s also effective with tall grasses blowing in the breeze. Car lights passing in a busy street scene are transformed into glowing lines slicing through your composition. A cascade at the base of the 150 foot drop of Dukes Creek Falls in White County, near Helen, Georgia. I made this photograph on a rainy March morning. I slowed the shutter speed with a six-stop neutral density filter, yielding a 50 second exposure. The camera sensor recorded the bright refection from each drop of water as it streaked by during the long exposure. The collection of these highlights gives a silky appearance to the water. As its name implies, ten stop ND filter will reduce the light exposing your image by ten stops. So, for example, working at dawn, if the proper exposure without the filter is 1/4 second, it’ll require an additional ten stops of exposure with the filter. That’s 4 minutes at the same aperture and ISO. There’s a phenomenal difference in the look of an image at 1/4 second and that at 4 minutes. But using this filter presents some challenges. It is a very dark filter. Little light passes thru it. If you hold a ten stop neutral density filter to your eye, you will not see through it. Same problem when you put it on your lens. I’ll present a work-around to this. Using a solid tripod is a must. Not only must you hold the camera steady during long exposures, you’ll find it necessary to hold the composition stable as you work with the filter. A shutter release cable will permit you to hold open the shutter without shaking the camera. It is necessary to work in manual mode while the ND filter is attached. In most cases, your camera’s meter will not get enough light to meter properly, so your exposure automation will not be reliable. Since you can’t see anything through the filter, neither you nor the camera will be able so focus. The trick is to focus without the filter on the lens. After obtaining focus, switch off auto-focusing so the camera does not try to refocus. Work carefully so you do not upset the sharp focus you just obtained. If you accidentally shift the focus, remove the filter, refocus, and again disable auto-focus. Before you attach the ND filter, you must decide how to determine the exposure. Here’s three ways. Two are cumbersome, one is super easy. 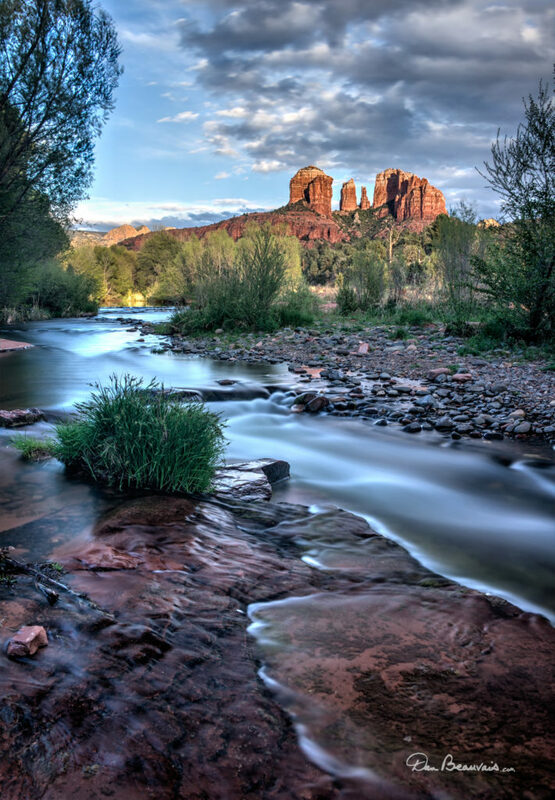 Springtime at Cathedral Rock and Oak Creek, Sedona, Arizona. This is an HDR (High Dynamic Range) image, comprised of four shots; 5, 10, 20, and 40 seconds, f/22, ISO 200, using a 6 stop ND filter. Determine your exposure without the ND filter. You can do this either with exposure automation on, or in manual exposure mode via the meter in your camera, or by making test exposures and checking your histogram. Insure that you aren’t clipping any important highlights, and have as many of the shadows as possible inside the histogram range. Once you are satisfied with the exposure, note the shutter speed. Switch to manual exposure. Carefully attach the ND filter, being careful not to upset the focus. Now, multiply the shutter speed, in decimal seconds, by 1024. (For you math geeks, 1024 is 2 to the 10th power. Ten stops!) Multiplying by 1000 instead of 1024 is close enough. Set that for your shutter speed. You may have to go to bulb setting. Using our previous example, 1/4 of a second is 0.25 seconds in decimals notation, multiply that by 1000, and you get 250 seconds, or 4 minutes and 10 seconds. (We have a little rounding-off error here. A ten second discrepancy in four minutes is not noticeable.) Yes, it works. But you may get brain blisters from all the math. Determine the correct exposure as above. Switch to manual exposure. Carefully attach the ND filter, being careful not to upset the focus. Use an ND Calculator smartphone app, enter the exposure without the filter, the number of stops in your ND filter (we’ve been discussing 10, but there are other densities available), and read out the new shutter speed for when you use the ND filter. Apps include ND Filter and ND Filter Calculator for Android, or ND Filter Calculator and LongTime for iPhone. Not as cumbersome. But there’s an easier way. 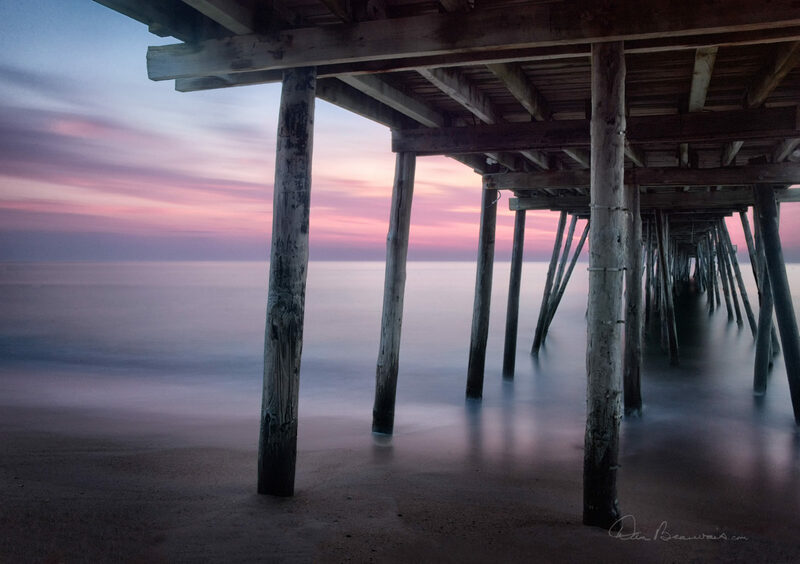 Dawn at Avalon Pier in Kill Devil Hills on the Outer Banks of North Carolina. I made this image about 10 minutes before sunrise, using a ten stop ND filter. Using the ISO 6400 trick, I determined that the ISO 100 exposure at f/16 would be 25 minutes. With the sun about the break the horizon, the light was changing too quickly to allow a 25 minute exposure. So I bumped the ISO by three stops to ISO 800, and shortened the shutter speed by three stops to 3 minutes. This rendered the sky and water perfectly. However, the underside of the pier was far too dark. The range of tones in the scene exceeded the sensor’s ability. So, I made a few bracketed exposures at the same ISO and aperture, but without the ND filter. The underside of the pier was nicely recorded at 1/2 second, but it blew out the water and sky. I combined the images in the digital darkroom to create the image as I saw it in my mind. Be sure you are in manual mode. Obtain focus, then attach your ND filter, being careful not to bump the focus. You are going to do the exposure determination and the final shoot both with the ND filter attached. For exposure testing purposes only, turn your ISO up to 6400, and determine the correct exposure by making test shots and checking the histogram. Note the shutter speed in seconds. At ISO 6400, these photos will be noisy, not what we want for a final image. Turn the ISO down to 100. The shutter speed you noted in seconds at ISO 6400 is the shutter speed in minutes at ISO 100! Set that shutter speed in minutes, possibly needing to use the bulb setting, and make your final exposure. Under the lighting conditions of our example, with a ten stop neutral density filter attached, and ISO at 6400, the shutter speed would be 4 seconds. Turn the ISO to 100, and the correct shutter speed is 4 minutes. Seconds -> Minutes. If you are going to make a mistake here, it will probably be forgetting to turn the ISO to 100 before making your “real” shot with the ND filter, so pay attention to that. You may be tempted to use exposure automation to make the ISO 6400 exposure determination. I’ve found that the meter is less accurate with such severely subdued light coming thru the lens because of the ND filter. If you get your ISO 6400 exposure in any way that relies on the meter, you may find that your final exposure is off. And since ND exposures can range into minutes in some cases, you don’t want to take more of those than necessary trying to dial it in. If you use test shots and check the histogram, it’s WYSIWYG – What You See Is What You Get! You are determining exposure by what the camera actually recorded, rather than by what the meter thinks the camera will record. You’ve taken the meter out of the equation. Note that this ISO 6400 trick is completely independent of the ten stop density of the filter we’re discussing. It can be used with any strength ND filter, even a variable ND filter. It has nothing at all to do with the filter! In fact, this trick is just as useful for any low light exposure determination. The key is the relationship between ISO 100 and ISO 6400, and between minutes and seconds. The difference between ISO 100 and 6400 is six stops (ISO 100, ISO 200, ISO 400, ISO 800, ISO 1600, ISO 3200, ISO 6400 – six steps.) The difference between 1 second and 1 minute is also six stops (1 sec, 2 sec, 4 sec, 8 sec, 15 sec, 30 sec, 60 sec – six steps.) So, holding aperture constant, the correct exposure in seconds at ISO 6400 is also a correct exposure in minutes at ISO 100. What if your camera only goes down to ISO 200? Figure the exposure at ISO 100, and use one half that time at ISO 200. That’s double the ISO sensitivity, one half the amount of time to expose. A one stop change of each. Again using our example, at ISO 200 the shutter speed would be 2 minutes. Try a strong neutral density filter, such as a ten stop ND, to open exciting creative possibilities. Find new ways to record moving items, turning the movement itself into compositional elements. And use the easy, fail-proof ISO 6400 trick to determine the exposure through that nearly opaque, but magical piece of glass. Thank you to Boston-based photographer Paul Treseler http://paul-treseler.artistwebsites.com/ for sharing this technique with me.